We provide residential bathroom installation and remodeling services for homeowners in New Jersey and Bucks and Montgomery Counties in Pennsylvania. Whether you refresh or completely renovate the space, we can add new functionality and elegance to your your home with a remodeled half or full bathroom. For only $4,499, our design-build team can provide you with a completely remodeled full bathroom. Our $4,499 basic bathroom finishing package includes an initial in-home consultation, measurements, design, and installation services. We also remove the shower walls down to studs, baseboard trim, and shower doors. We supply and install the cement board for the walls in your new bathtub or shower. And, we will install wall tile for your new bathtub or shower, tile flooring, baseboard trim, and bathroom accessories such as towel racks and toilet paper holders. Learn more – Schedule your free, in-home consultation. 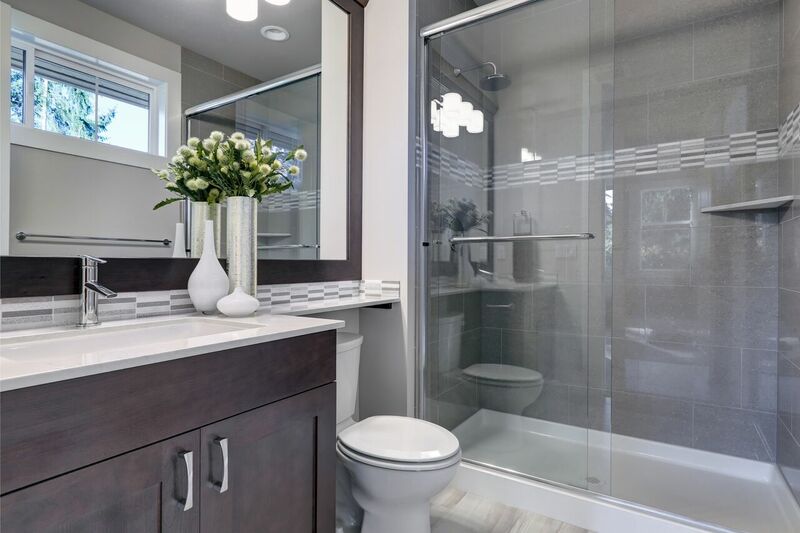 For only $9,999, our design-build team can provide you with a completely remodeled full bathroom and supply all materials required for your project. As will our basic bathroom finishing package, our $9,999 package includes an initial in-home consultation, measurements, design, demolition, and installation services. The difference – all materials for this option are supplied by us, and are selected by you from our extensive selection of bathroom tile, bathroom cabinets, and bathroom fixtures. Learn more – Schedule your free, in-home consultation. For homeowners interested in a modest bathroom update, we offer tub-to-shower conversions for only $2,499. We supply and install the cement board for the walls in your new shower, the shower conversion pan, and homeowner-provided shower doors, shower diverter kit, shower tile, and grout. Learn more – Schedule your free, in-home consultation. We provide options and upgrades to customize your bathroom remodeling project. Our experienced team of professional designers and installers can personalize your full or half bathroom to make it unique to your home and tastes. Learn more – Schedule your FREE in-home consultation. If you’re in the planning stage of your bathroom remodel, get ideas from our portfolio of completed bathroom remodeling projects. Our goal is to provide each customer with a satisfying experience, and the result is the high referral rate to family and friends. Don’t take our word for it – we let our customers speak for us – look at what they are saying.